Facebook is breaking out its equivalent of a "Greatest Hits" album with a new feature that recycles your old content from years gone by. 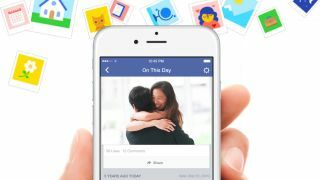 "On This Day," drawing only from today's date, surfaces status updates, photos, posts from friends and other things you've shared or been tagged, according to the social media company. This time capsule can be found at facebook.com/onthisday, but the company warns that it's not available for everyone. It's another slow feature roll out. Facebook also made clear that only you see this past content. Those embarrassing photos of you and an ex, for example, are shared with friend if you decide to reshare (or re-reshare). If Facebook's On This Day feature sounds familiar, it should. It apes the underrated Timehop app that also reports what you did one, two, three and so on, years ago. Timehop, available for iOS 8 and Android, actually goes a few steps further by showing Twitter, Instagram, Flickr and Foursquare posts too. However, Facebook's siloed take on this may be more convenient with the ability to subscribe to notifications so that you know when you have memories to look back on. Sometimes, services like On This Day and Timehop let you see how much you have or haven't grown. It's a scary proposition. But the benefit is not having to always dive back into a crowded Timeline to retrieve those memories.